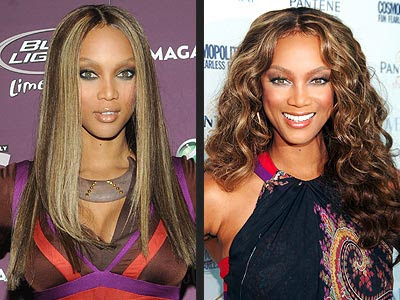 Tyra Banks is my favorite model. I like her wit and the way she look at things. She is not perfect, she has her own flaw but, she tried to make it better each time. Celebrities are subject to criticism and she is not exempted. As famous as she is right now, she is still being ridiculed. I admire her perseverance to accomplish the things she wanted in life despite the odds. I saw her interview tonight and I couldn't help but, admire her more. By the way, I do watch the America's Top Model and Tyra Bank's Show. How about you? There are people in this world who are so righteous. What would you do if you encounter one? I knew one at naturingan ko pa namang bestfriend (kuno!) pero di na ngayon, hehe! do i sound so mean? hahaha, just trying to answer your question here, ams! btw, i like tyra banks too. humble naman sya ah, ba't kini criticize? I do like Tyra too and the way her principles and philosophy in life. She knows how to understand people and not just them by its cover. I always have both of her shows recorded so I won't miss any episodes. I love America's Next Top Model and Tyra Show as well! we cant please everybody talaga ano? shes a beauty. i have not been watching the entertainment shows recently. busy akong beauty sa pag cge ug limpyo sa dust inig abot sa office. kapoy oi.